Today we’re going to talk about another member of the 2007 Marvel Comics series The Twelve called the Fiery Mask. 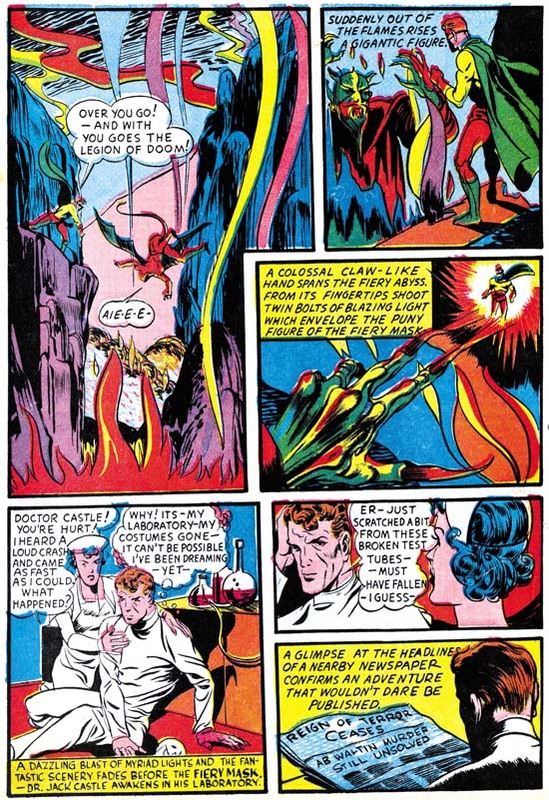 What’s interesting is that out of all the twelve Golden Age heroes that were in the comic book series the Fiery Mask is a hero with one of the longest and most interesting Golden Age careers out there. He had pedigree and he had some pretty interesting Golden Age stories. Let’s take a look. 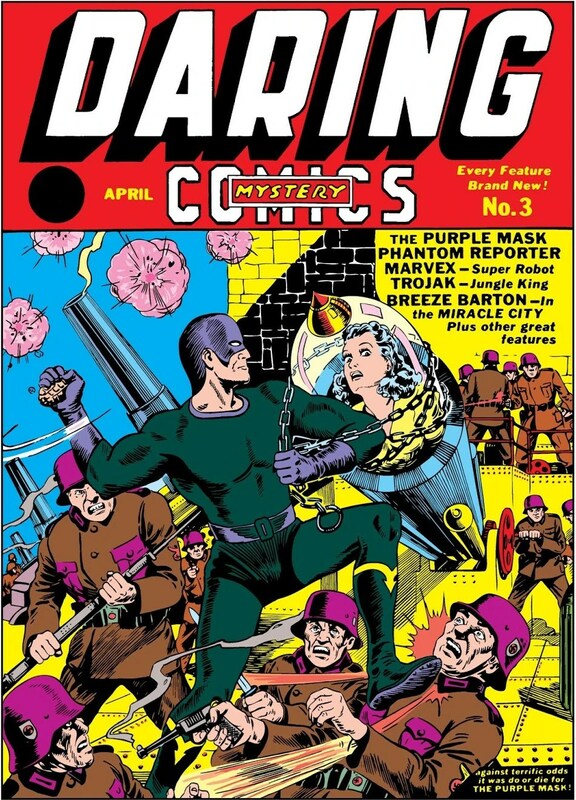 The Fiery Mask debuted in the Timely Comics book series Daring Mystery Comics #1 in January of 1940.
who helped create a little known superhero named Captain America (you’ve probably never heard of him, he’s really obscure). His origin story was titled The Fantastic Thriller of the Walking Corpses. Jack Castle was a doctor who worked with the police and one day he was called in to investigate a strange case where corpses were coming back to life thanks to a mysterious beam of light. So right off the bat we have zombies and weird science fiction, a good start. Jack investigates this strange phenomenon until he is eventually kidnapped by the zombies and dragged before their leader. Side note: it should be noted here that at this time in pop culture history a zombie was a creature who was a mindless slave to a single person, not the brain hungry hoards we know and love today. who was using the ray to turn the city’s homeless population into a zombie slave army. Unfortunately for the Zombie Master the ray didn’t work on Jack and in his rage the villain cranked up the power causing a massive explosion that killed him and gave Jack super strength and the ability to control fire. Naturally being the noble spirit that most superheroes of the Golden Age were Jack Castle decided to use his powers to become a superhero. 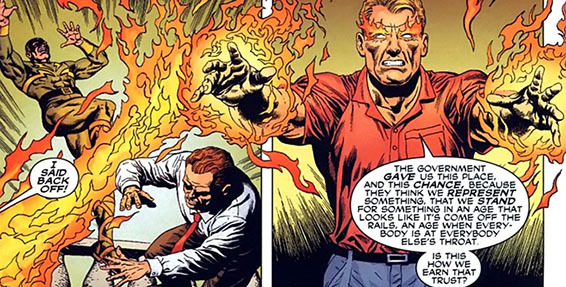 So after a pretty awesome origin story The Fiery Mask’s next appearance was in The Human Torch Comics #2. Here he faced the villainous Dr. Simon Sendach, a scientist obsessed with creating artificial organs to transplant into humans. He had even had success in creating an artificial stomach that could sustain the human body on a diet of blood. However it had the side effect of turning the recipient of the device into a bloodthirsty maniac similar to a vampire. who sought to take over the world by creating a strange blob like creature that ate human flesh. and traveled to Hell where he fought and beat a demon who was committing a string of gruesome murders in out world. Sadly the Fiery Mask was much to awesome to last for very long. I guess the flame that burns brightest burns half as long (pun very much intended). The hero would fade into obscurity until 2007 when he was featured as an important character in J. Michael Straczynski’s The Twelve. 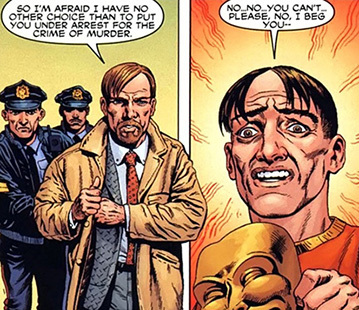 Like the rest of his teammates the Fiery Mask was captured by the Nazis and placed in stasis, only to be forgotten until they were rediscovered in 2007 and returned to the United States where they were slowly reintroduced to society. The Fiery Mask wouldn’t play much of a role in the beginning of the series. Around the middle of the series it was revealed that his origin story was simply made up. 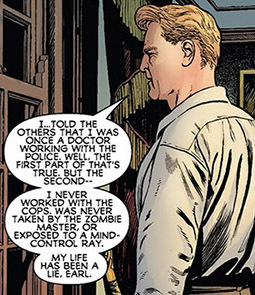 Instead of gaining his powers from the science of the Zombie Master he had actually been granted the ability to control fire by a man who had been killed by a mob hit. To that I say…BOOO! BOOO! They had the gall to change one of the coolest and cheesiest Golden Age origin stories to a man gaining his powers thanks to a simple set of circumstances?! 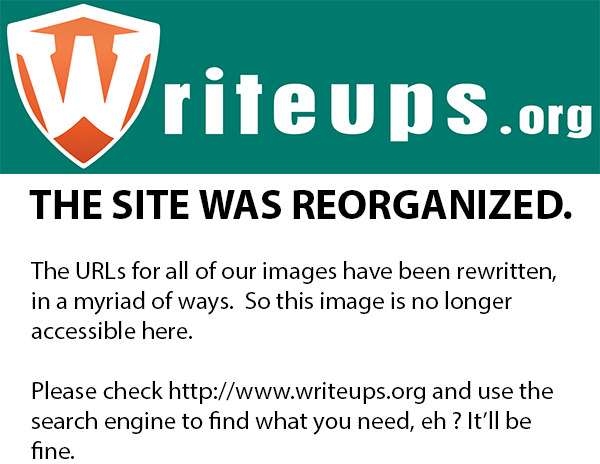 Poor form Mr. Straczynski! Poor form! 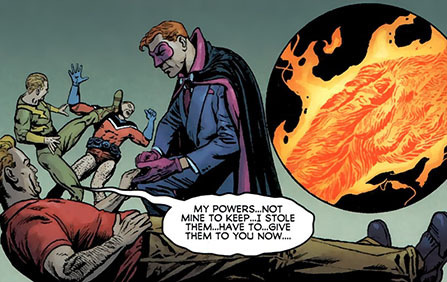 Sadly this new revelation, that the Fiery Mask’s powers could be transferred to other human beings, would prove to be integral to the plot of the story. At the very end of the series all the heroes confront each other over the death of the Blue Blade at the hands of Electro. The Phantom Reporter reveals that it was one of their own who committed the crime: The Dynamic Man. Fiery Mask attempts to keep the peace. But he fails and the Dynamic Man is revealed to be a half crazed android who attacks the group. 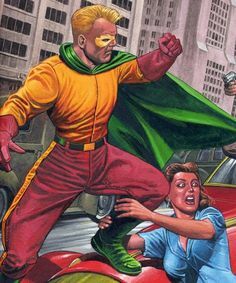 Dynamic Man manged to crush the Fiery Mask’s windpipe but just before the Mask died he managed to transfer his powers to the Phantom Reporter. Who then proceeded to use his new gifts to end the fight and destroy Dynamic Man for good. 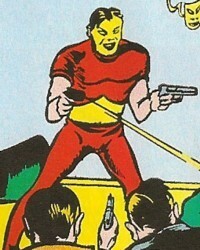 The Fiery Mask had one of the longest lasting Golden Age careers ever enjoyed by his colleagues from The Twelve. Granted, that may not be saying much but the stories he was a part of were some of the strangest and most interesting stories in an age where strange characters and events ruled comic book. It’s just a crying shame they all turned out to be lies. 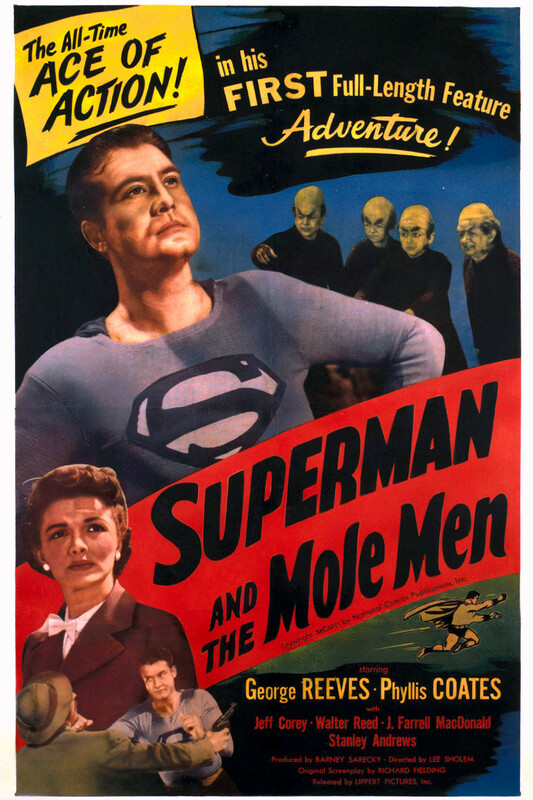 and the gloriously cheesy yet surprisingly touching 1951 movie Superman and the Mole Men. Why do I bring these two examples up? 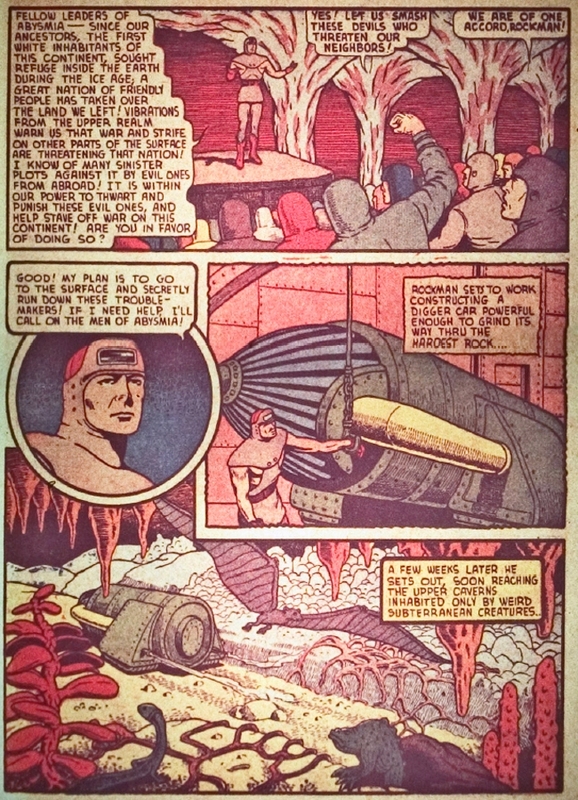 Because they all ascribe to the idea that there is an entire world living underneath our feet just like today’s Golden Age superhero: Rockman. Rockman first appeared in USA Comics #1 in August of 1941.
and one of Rockman’s stories was signed by Stan Lee himself. Rockman was actually a member of the mysterious underground kingdom of Abysmia, a kingdom under the surface of North America and allegedly founded by the first white settlers of the continent. Rockman is the leader of the Abysmians and realizes that in order to protect his kingdom he must ascend to the surface because the vibrations he was reading told him that the surface dwellers were at war. Once he got the surface Rockman used is incredible strength, speed, and ability to withstand incredible pressure and lack of oxygen to do what all Golden Age heroes did best: beating the crap out of Nazi and Japanese caricatures. His first menace was to fight and defeat the nefarious Zombo, a man who was capable of hypnotizing other people to do his bidding and was running around the Pacific sinking ships. and his final adventure had him facing off and defeating the villainous Le Barbe who made the grave mistake of trying to take over all the gold mines in Alaska. Despite the fact that Rockman had some top tier talent behind him he only lasted four issues, probably falling victim to the same issues of lack of interest that the majority of his Golden Age compatriots suffered. There was also the problem with Rockman being a bit…bland. Sure he was a king with a secret kingdom and sure he had advanced technology and gadgets, and sure he had a cool idea behind him but there just wasn’t a whole lot of nuance to the character. He was the kind of hero that was fun for a couple of stories but not much after that. Rockman would later be revived in the 2007-2008 comic book mini series The Twelve where a lot of that would change. The new Rockman got a face lift from artist Chris Weston where he looked a lot more intimidating. He even got to keep some of his gadgets like the Digger Car. 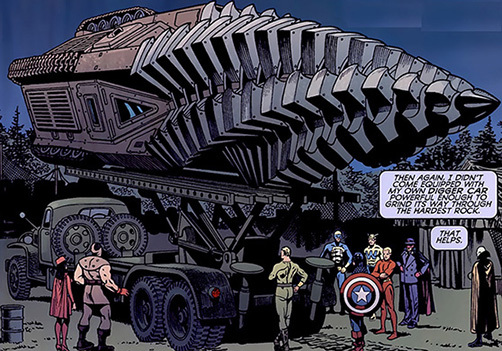 However, all the gadgets in the world couldn’t save Rockman and the rest of the group when they were captured and placed into stasis by Nazi scientists only to be discovered over sixty years later. 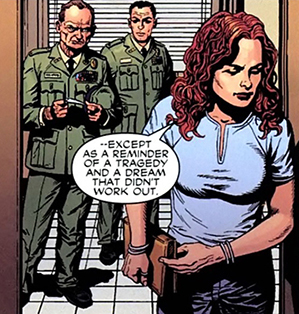 We’ve been covering the Twelve for a while now and one of the things that has fascinated me the most about the series is how Michael J. Straczynski turns the story into a deeply poignant tale about recovering lost identity and re discovering your place in a world that has moved on. For some members of the twelve this works out perfectly. However, Rockman was one of the hardest hit by the change. Even though the group was moved to a mansion in upstate New York Rockman spent most of his time in the cellar beating his fists against the ground in a vain attempt to contact his long lost kingdom of Abyssia. However, it turned out that Abyssia may have not been a real place and that Rockman was actually suffering from something much darker than homesickness. While it was never confirmed in the series proper it was strong hinted that Rockman wasn’t actually a being from an ancient kingdom but a former miner by the name of Daniel Rose. everything about Rockman from the equipment he used to the kingdom of Abyssia, was a coping mechanism designed by Daniel to cope with the loss of his family and friends to a mining accident. Daniel had been a coal miner in West Virginia where he had attempted to form a union but when a local boss threatened to hurt his family Daniel and the miners fought back, causing a horrific accident that somehow released a mutagen gas that gave Daniel super strength. Since he was the only survivor Daniel was wracked with guilt and spent the rest of his days pining for his lost kingdom and not remembering the family he once had. While he never discovered his true identity and never found is old home Rockman died a hero, protecting his colleagues trapped in the mansion after another of the heroes named Dynamic Man attempted to kill them by lighting the house on fire. Rockman is an interesting case in the study of Golden Age superheroes. On one hand he is presented as a king, ruler of his own lands and a steadfast warrior who fought to protect his people and the world above him but on the other hand he is presented as a mentally scared and unbalanced man who was given superpowers and used them to cope with the death of his family. It’s actually kind of funny, on one hand he’s like Aquaman and on the other he’s like Batman. 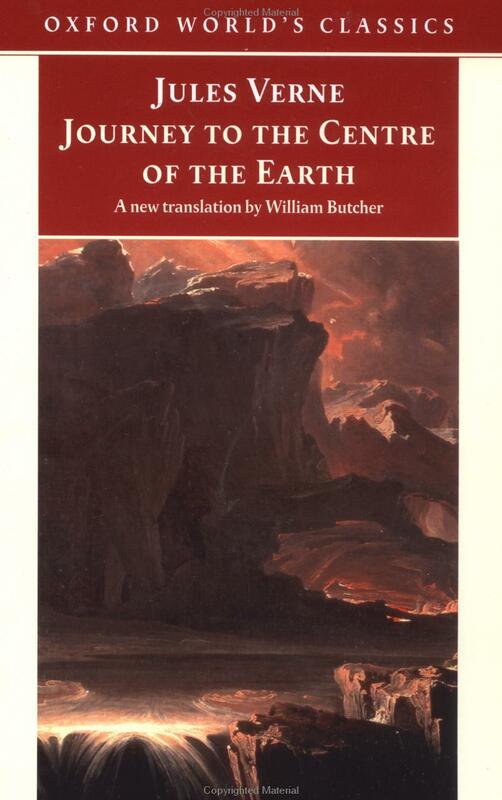 You know who we haven’t talked about very much on this blog series? Stan Lee. 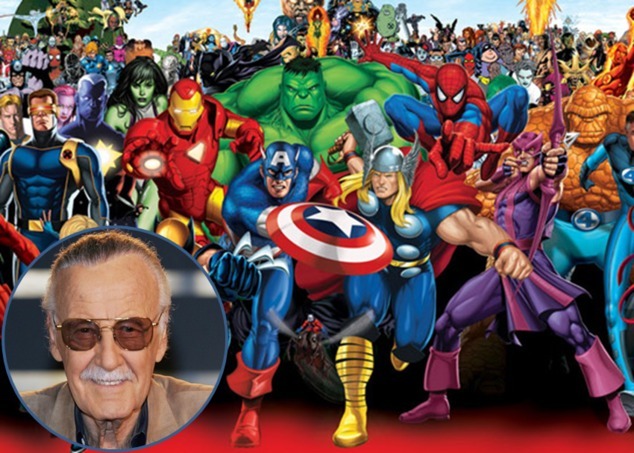 His most impressive creative period was the 1960’s, where he created some of the most iconic characters of all time and secured his place as a legend of comic books. But the man’s impressive body of work didn’t just spring out of a vacuum. 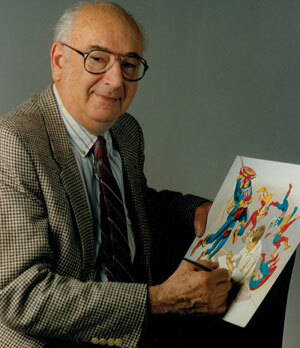 The man started working in the comic book business at the very beginning in 1939 back when his name was Stanley Lieber (he used Stan Lee as a pseudonym and would later have it legally changed) and would eventually rise through the ranks to become the man he is today. 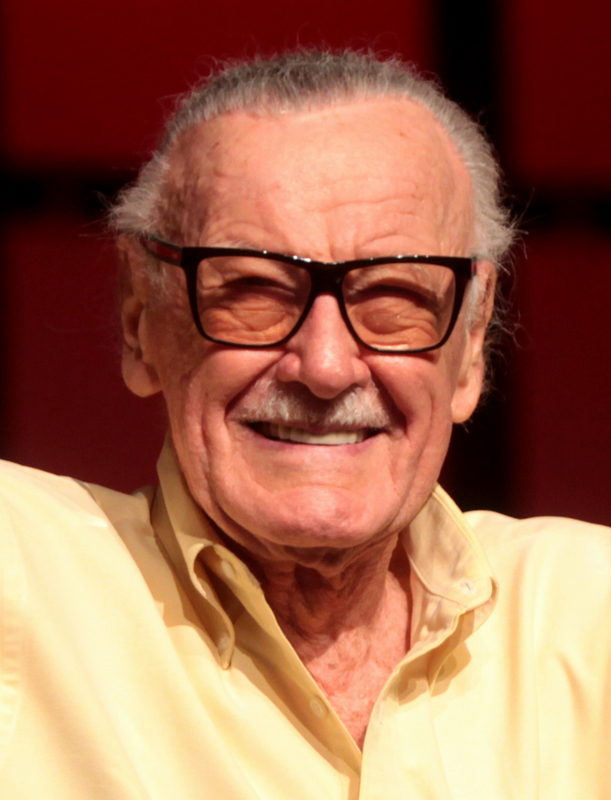 The name was a pretty cheesy pseudonym for Stan Lee but even though the Witness wasn’t the first hero that Lee would create for Timely (oh we’ll definitely be getting to those), he was definitely one of the most interesting. 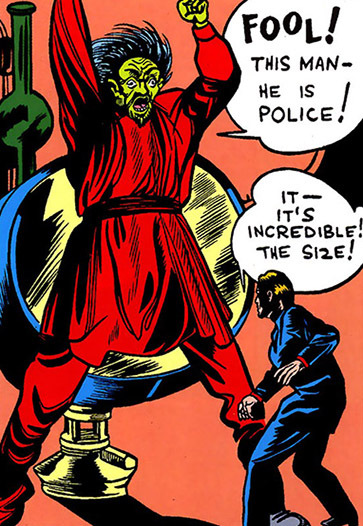 The Witness first appeared in Mystic Comics #7 in December 1941. He was a Jewish kid who grew up to join the Chicago Police as a detective until he accidentally shot an innocent man in the line of duty. He was tried and sent to prison, something that only seems to happen in fiction nowadays, for two years and when he got out life wasn’t much better. In another interesting twist the poor man attempted to commit suicide but was saved by a mysterious voice who told him it wasn’t his time. He would later become the costumed hero The Witness. His power set was actually pretty interesting because while he didn’t have super strength of flight he did have a strange ability to tell who was going to be the victim of a crime before it happened. He would then find the future victim, observe them, and then decide if they deserved to be saved or whether he would simply be a witness to the crime. 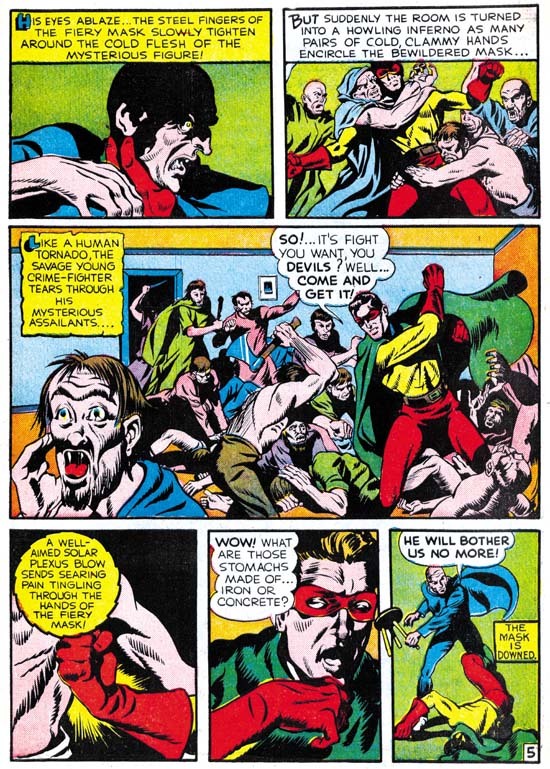 In his first appearance he brought down a group of assassins called the League of Blood and their evil leader Mr. Natas (groan) who the Witness sent hurdling to his death. He also discovered that a humble pawn shop owner named Booie Dawdly was actually a highly accomplished mobster and jewel thief known as the Imp. His final adventure involved him breaking up a gambling ring on a ship. 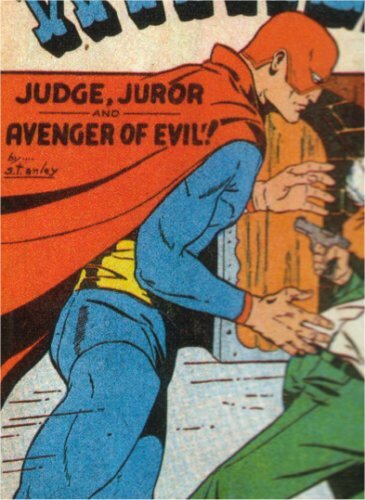 Like so many superheroes of the time The Witness only had two stories in the 1940’s and would have been doomed to obscurity if it wasn’t for his revival in the 2007 series The Twelve. In the series the Witness was sent to Europe to fight in WW2 where he witnessed the horrible events that happened at Auschwitz. While the events must have had a terrible impact on the psyche of a Jewish American hero he didn’t allow it to faze him as he joined his comrades for an assault on Berlin. However, the Twelve were captured and placed in suspended animation by Nazi scientists where they would remain until 2007 when they were rediscovered. The Witness actually took the change of scenery pretty well. However, his powers prevented him from enjoying his new life and he was called to a diner to witness a death. It turned out the man who was doomed to die was actually a prison guard from Auschwitz and the hero watches as the man was run over by a truck. He was also called to witness the death of his teammates after it was revealed that Dynamic Man had actually gone crazy and started killing his former teammates. His story arc ended with him surviving the destruction and disappearing off the face of the Earth. 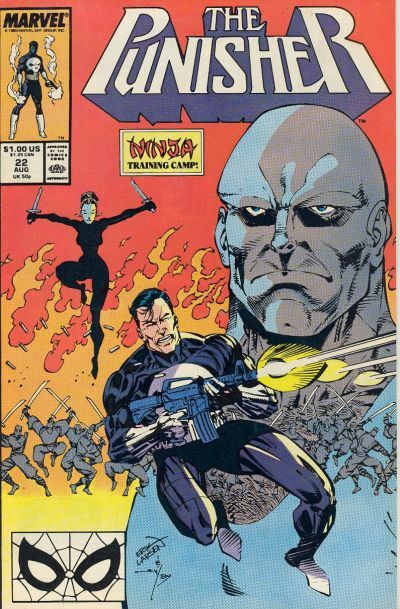 It turned out he had recruited by Nick Fury in order to work for SHIELD as an operative who punished anyone who had committed a crime. The Witness was a strange hero. On one hand he was actively punishing those who he knew were guilty but on the other hand he was doomed to remain a passive observer in the lives and deaths of random people he had never known. Regardless, the Witness was one of the most interesting heroes to come out of the Golden Age and a definite sign of Stan Lee’s budding genius. Hey! Want to show your support for “The Golden Age Showcase”? Buy a Cambrian Comics T-Shirt on Teespring! You’ll be supporting great content like this as well as our other projects such as “The Secret Lives of Villains” webcomic and “Crowdfunded Comics that deserve more attention”. Click here to order! 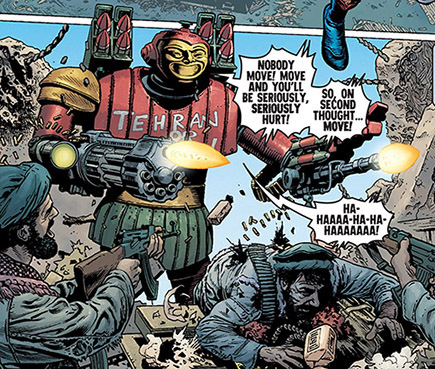 A lot of people tend to think of the “superhero who has no qualms about killing people” as a relatively modern idea and they usually associate this idea with the Punisher. and neither did today’s hero: The Laughing Mask. 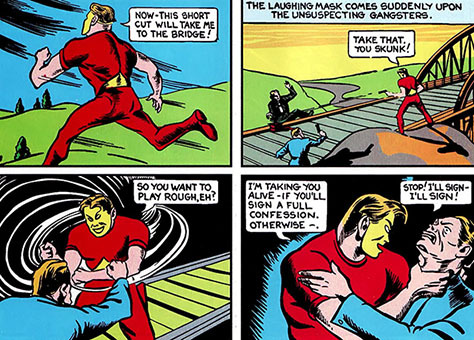 The Laughing Mask first appeared in Daring Comics #2 in November 1939 and was created by William Harr and Maurice Gutwirth. The hero started off as the idealistic Dennis Burton, an assistant District Attorney for the city of Rapid Falls. Dennis was disillusioned with the ease that criminals were able to escape justice thanks to an increasingly corrupt legal system. and slaughter every gangster involved in the plot except one who was forced to sign a confession and turn himself in. Sadly, this disguise would only last one issue and in November of 1940 a new vigilante with the exact same name, equipment, and penchant for violence appeared calling himself Purple Mask. and another much more tame story where he foiled a bank robbery. 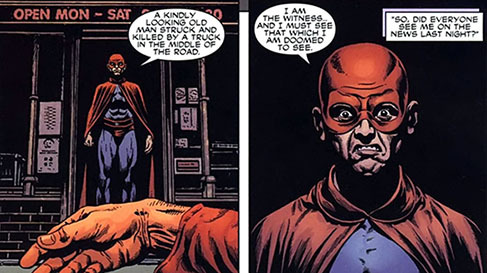 The Laughing/Purple Mask disappeared off the face of the Earth until he reappeared in the 2008 comic book series The Twelve. Part of a team of twelve heroes that were tasked with assaulting Berlin at the tail end of WW2 the Twelve were subsequently captured and put in stasis. When they were re discovered and thawed out years later the new challenge was for each team member to try and readjust to modern life. 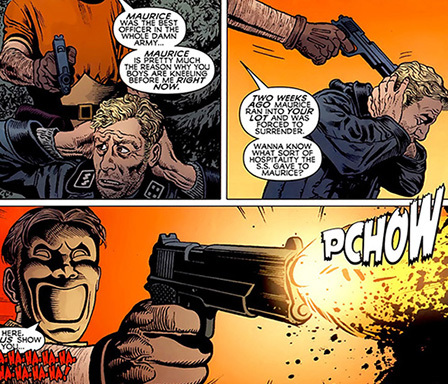 This was a problem for The Laughing Mask because almost as soon as he was thawed out he was arrested for murdering a group of gangsters 60 years earlier. It was also revealed that the Laughing Mask had executed a group of German prisoners while operating in Germany during the war, demonstrating that he was probably mentall unsound. 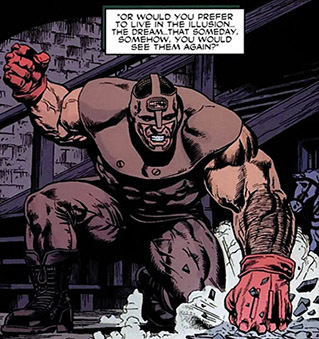 However, his arrest probably saved his life because while the Laughing Mask was in jail the rest of the Twelve were engaged in a brutal bit of infighting that resulted in a lot of the heroes dying. Dennis Burton would later reach a deal with the United States government. In exchange for a pardon he would operate a robot named Electro, a telepathically controlled robot that belonged to a former teammate of the Twelve, and carry out missions for the government. He was last seen attacking a Middle Eastern drug ring and loving every minute of it. The Laughing Mask was one of the first examples of how violent and savage the early vigilantes could be. He was brutal, uncompromising, and wasn’t afraid of taking a life long before modern comic books began writing heroes that were not afraid to kill. Today’s Kickstarter highlight is for a four part comic book mini series called “Girls Heist Out”. According to the description the girl who is swan diving off the balcony is named Julia who has just been set up by her boyfriend (although I would assume ex boyfriend at this point) and has to make a quick escape. The series follows Julia as she recruits three other women to take revenge on her boyfriend and steal his stuff away from him. I like it because it’s well written, well paced, well directed, and the actors have some of the best chemistry I’ve ever seen. It’s a bunch of whip smart guys coming together to solve a problem in a whip smart way that results in the main characters winning, the bad guys losing, and nobody getting hurt. You know what else I’ve been doing recently? Reading Robert Kirkman’s Thief of Thieves. 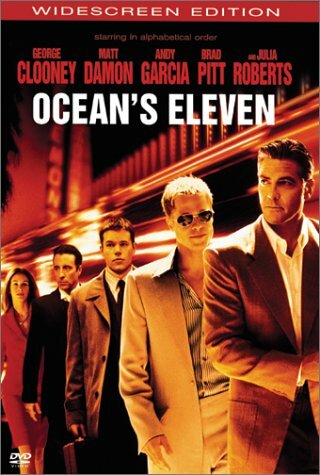 Not as whip smart or as funny as Ocean’s Eleven but it is still an amazing book and does a fantastic job of bringing the reader into the life of a group of people who make a living stealing things. While I don’t know much about Girl’s Heist Out everything I’ve seen reminds me of these two stories and that is some of the highest praise I can give. I could go on about how comic books could use more stories centered around women, I could go on about how the crime genre is one of the best kinds of stories for comic books, and I could go on about how it’s important for the health of the comic book medium to support indie creators and branch out into new and exciting stories but I’m not going to. I’m not going to do that because better writers than me have done that already and I don’t think the discussion needs another voice added to the mix. What I am going to do is leave you with a screenshot of a tweet from John Rogers, creator of the tv show Leverage.